Jonathan and Nicki were an incredible support on our wedding day. I literally can not imagine our day without them. 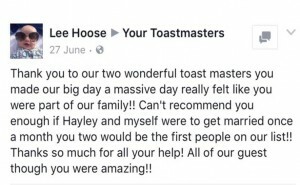 I really had never thought about having a toast master at our wedding and didn't understand what their actual role would be. We saw them at a wedding fayre doing the sabrage and thought that this would be a fun lovely idea. Once we got chatting to them both, and saw how enthusiastic and lovely they were we booked them there and then. 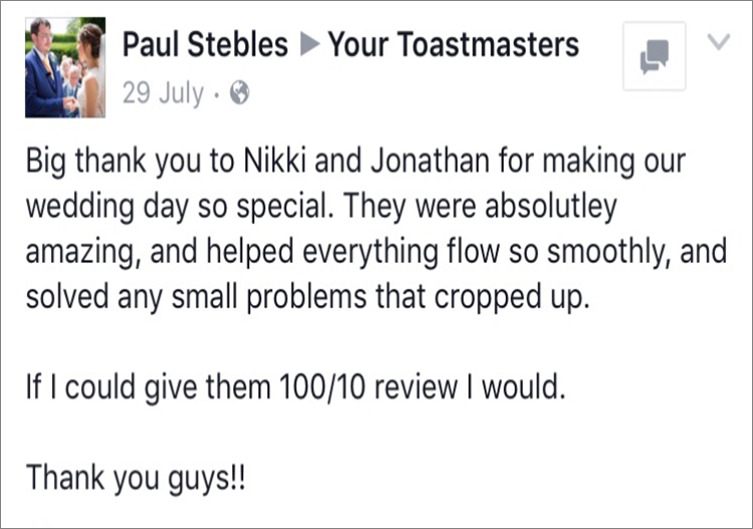 Having them both there was just perfect, no other toastmasters could have possibly have come close to what they did for us. They were with us in every possible way without being intrusive, they were discreet but were aware of everything going on. 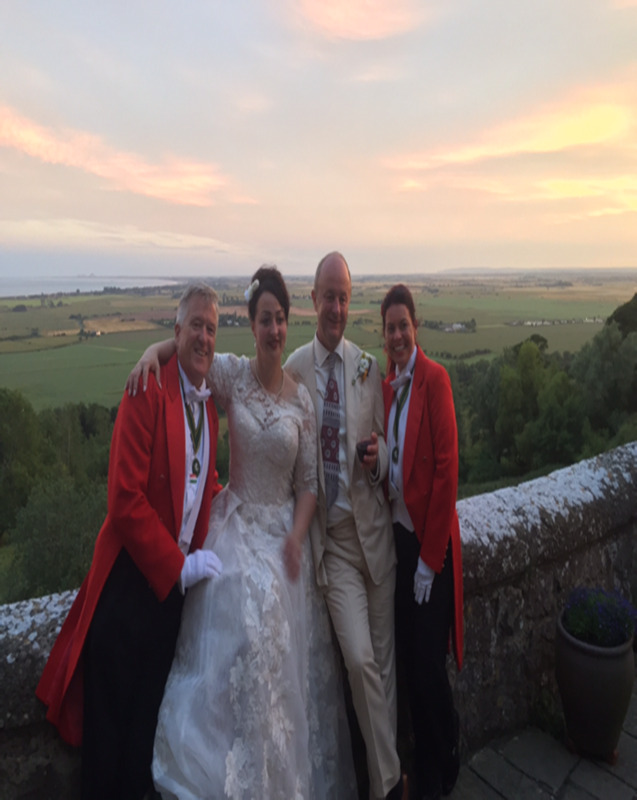 Our wedding was unique in that it was spread over three venues in two different towns 30 minutes apart they navigated it brilliantly, co ordinating our guests and ensuring everyone arrived on time and somehow magically arriving before everyone at all the venues. Despite only meeting them on a few occasions prior to the wedding day they felt like they were part of the wedding party, it wasn't like having two strangers with us, they were relaxed, supportive, and friendly. It wasn't just us that thought so either all of our guests commented on what a nice touch it was having them there. They went to both houses in the morning to make sure all the button holes were on correctly, they co ordinated the photos, ensured that the elderly guests were guided and sat down safely, they directed all of the bridesmaids and flower girls down they isle, they found lost flowers and so much more! The support they offered not just us but all of the wedding party was incredible I could not recommend them enough, the decision to hire them both at the wedding was an easy one but literally on of the best ones we made. Love was definitely in the air for the wedding of Mr & Mrs Smith and Knowle Country House was the most romantic of settings for a very emotional wedding. Testimonial from Knowle Country House. On behalf of the knowle country house staff would just like to say how lovely it was to have worked with you. 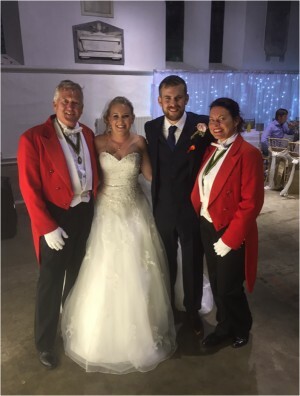 You both were very organised, approachable and cooperative to ensure a smooth wedding day for the lovely Sophie and Billy. The enthusiastic nature of you both coincided with your professionalism which instilled confidence within myself and other staff members for a successful day. Looking forward to having you both at our wedding venue again. Thanks again for being so utterly amazing, both of you. So many of the staff mentioned yesterday how great it was having you there and want you to be there for every wedding! Really does change my day and take so much stress of me which is so so appreciated. Can't wait to see you both again very soon. Mr & Mrs Steebles had a very special day with their marriage at Port Lympne followed by a blessing . An amazing Moldovian wedding. On the hottest day of the summer Mr & Mrs Martin had a wonderful Royal Garden Party style wedding in the garden of their family home. It was a perfect day for everyone. Because our wedding was at home it was such a help to have the services of Niki and Jonathan . They took care of all the finer details ensuring the day was run smoothly. The guests were happy and we all had a wonderful day. The sabrage added an extra special touch to the toasts and the groom enjoyed having everyone's eyes on him. 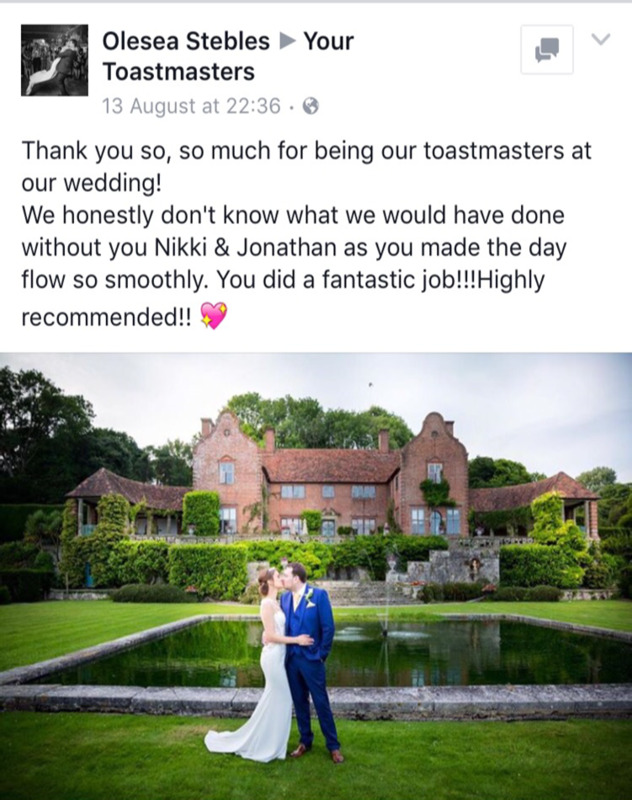 I would like to thank Niki and Jonathan for their friendly and professional service and can recommend them to anyone who may be thinking of having toastmasters at their wedding. Heather and Phillip Martin . 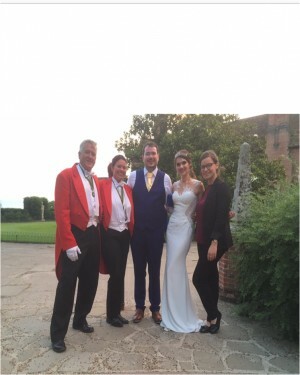 Mr & Mrs Taylor had a fantastic wedding event at Lympne Castle . Filled with Hungarian cake and Folk dancers. 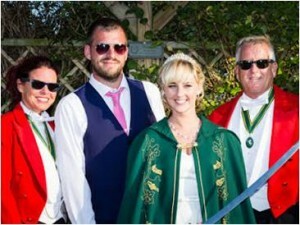 The couple brought their Hungarian traditions and culture to the Kent Countryside. Hi Nikki & Jonathan, Never had the chance to say thank you so much for everything! You were amazing throughout. 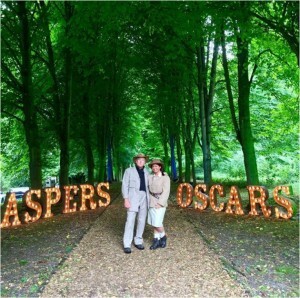 Aspers Oscars - amazing how the grounds of Port Lympne Mansion House were transformed for a one night only corporate event. Mr & Mrs Sharpe had an amazing burlesque and 1920's themed 10th anniversary party at Morgans Margate. An event packed with talented performers even Nikki couldn't resist joining in! We had the pleasure of using Your Toastmasters for our anniversary at Morgans Bar in Margate. Nikki and John were asked to provide a complete package for a 1920s night themed event. They organised the evening with professional competence , from high standard catering exactly as requested, to themed music for all tastes. Everyone enjoyed the evening that was impeccably organised by Nikki and John and would recommend them to organise any event .we applaud them for a fantastic evening. 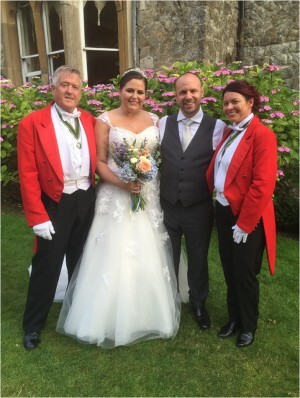 Mr & Mrs Hoose were married at St Augustines, Westgate, Thanet. These guys knew how to party and what a great day it was - a beautiful family wedding. 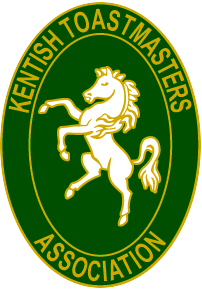 We were delighted to be the Master of Ceremony once again for the Kent FA annual dinner and awards ceremony at the Great Danes Hotel, Hollingbourne, Maidstone.